Her watershed moment happened in seventh grade. That’s when Lynette Hauser discovered how much she liked science thanks to a yearlong program called Watershed. With 37 other students and two teachers the entire curriculum including history, math, English, and science, focused on two area streams in her hometown, Radnor, Pa.
“We learned the history of the streams, we did water testing and collected invertebrates to learn about the health of the streams – everything,” said Hauser, today an assistant biology professor on the Portsmouth Campus. Hauser and Stowell formerly taught at Piedmont Virginia Community College, which also implemented the prerequisite, so both were naturals to head the committee to introduce the requirement at TCC. Hauser said biology faculty noticed many of the students struggling with Bio 141 lacked a basic foundation in biology and chemistry. Hauser began teaching the two-credit, eight-week NAS 2 course at TCC this summer and will teach four sections this fall. Six lab activities are included with the course, which covers the first three chapters of the same textbook used for Bio 141 and 142. Hauser is cognizant of students having different learning styles, so she uses a variety of resources to ensure they understand material she admits can be overwhelming. Outlines asking direct questions go with each of her lectures, and Hauser leaves space for note taking. 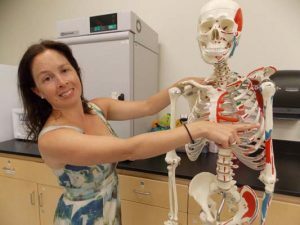 Hauser was a natural in science, earning her bachelor’s in biology from Goucher College in 2001 and her master’s in environmental science focusing on ecology from the University of Virginia. She plans to finish her doctorate in community college leadership from Old Dominion University by August. Hauser started at TCC in 2011 and enjoys the diversity in her classroom and the intimate setting that allows her to connect with her students. Hauser loves spending free time with her dogs: Moxie, a Labrador/Great Dane mix and Gracie, a terrier. A dancer since age 4, Hauser takes ballet and modern dance classes at a Norfolk studio. She and her husband, Eric, reside in Portsmouth.